Discussion in 'Battle Reports' started by Itepixcauh, Aug 24, 2018. Welcome to the KINGS OF THE NORTH BATTLE! 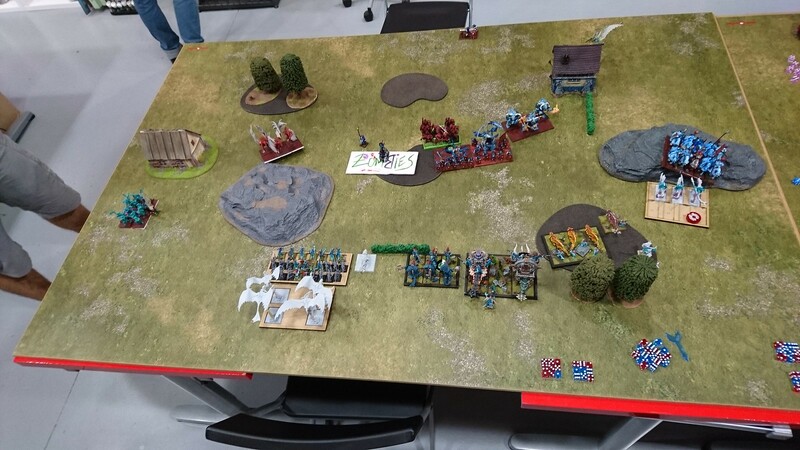 We have two different KoW leagues in our small city, one for each LFGS we have, I only take part in one of them due to time restrains, so talking to the winner of the other one we thought it would be a funny idea to pitch the two winners against each other for the tittle of KING OF THE NORTH. We know each other very well and he is always a good challenge, you also cannot really be a nicer guy than him or you would implode into a neutron star of kindness. That is some very nasty list, things to be aware of are that damn flying Vampire, the Soul Reavers that cannot get wavered and the Lich King with Heal (9)!!!! That much Heal pretty much negates all my shooting. That paired with a Horde of Revenants with Lifeleech (2) means that those Revenants wont die unless I can take them in one go. I went for a slight variation, to fit two Lekelidons I dropped the second Mage-Priest and opted for a Mounted Herald to have better Inspiring support that I found lacking last time I played 2000 points. I also dropped the Pathfinder on the Lancers. I deployed my centre as usual and layered my Ancients behind the Tyrants and FE knowing that I could open the Hordes of Infantry up and use the clear lane for the Ancients, My Lancers were also placed in the other clear lane to avoid being hindered, A match against the Revenant Cavalry is good to me as I can grind better and have faster heroes for support of needed. His right flank is just crazy so I decided from the get go to surrender it, I will try to avoid combat with those units for as long as possible (Wraiths, werewolves and flying Vampire) AVOID, I knew I needed something to delay and distract them so my Skyriders, and Battle Captain will distract and condition his movement while my Ghekkotah warriors will be used as cannon fodder. If I can delay those units until turn 4-5 I will be happy while the centre units obliterate his centre and take the tokens into his half. I win the roll to start and as usual I give him first turn as I need to react to his huge range threat, I will be boxed a bit at the start but as my centre units are way faster than his I can live with that. My Push token is in the Tyrants and his in the Revenant horde. 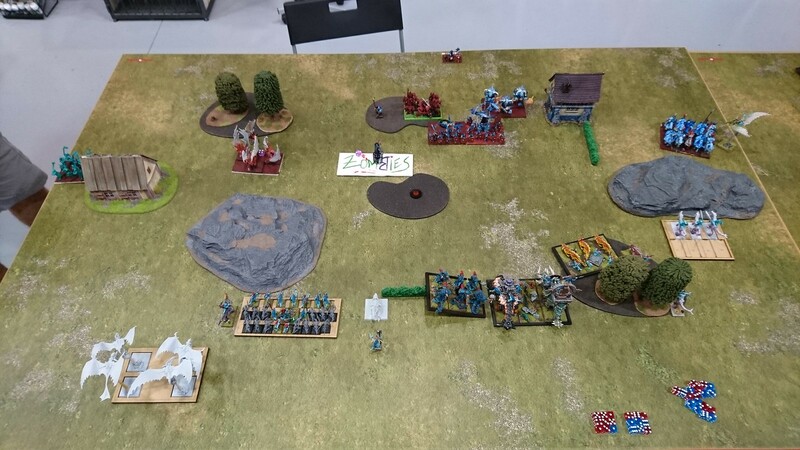 He moves all his line forwards, with the Wraiths taking the long route to get into the flank of my line, in his shooting the phase the Lich Surges the Zombies forwards and the Catapult misses my Ancients as catapults do. In my turn 1 I move very conservatively, being sure to be outside charge ranges with everything, and using the Hills to hide my units behind so he can't see them, creating a Hilly Mexican Stand-off that I very much like specially in my left flank, but as long as I can delay his fast units from entering the fray the better. The only exception is my Skylord that can fly to the flank of his Revenant Cavalry that are too far away from any Surge casters, he will hunt down that Catapult and the Lich King if he can. I decide to spread my shooting so his Lich can't heal everything and so I do, putting 4 wounds into the Werewolves with my Skyriders and my Lekelidons chipping wounds away from the Zombies and Zombie Trolls. He continue with his positioning, he is patient enough. The Wraiths move to look at my flank and the Vampire moves into position to shut down my Skyriders or leap into the middle. His centre line moves not giving me any charges. 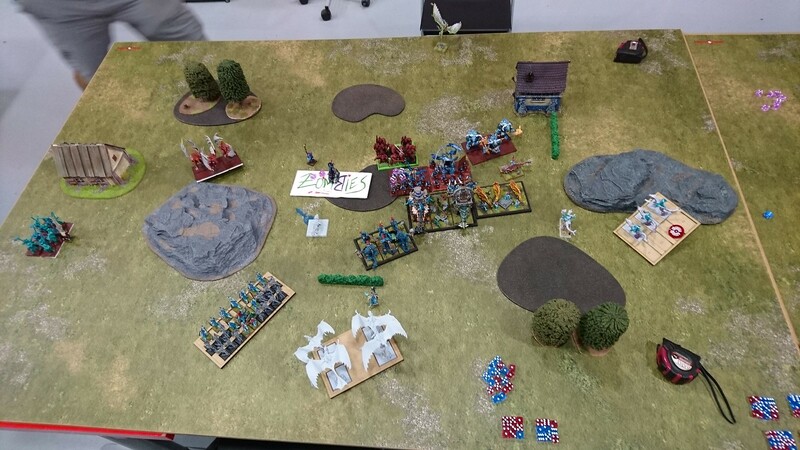 He decides that a stand-of is not what he wants in the right and moves the Revenants to block my Lancers into place. He Heals the Werewolves with the Lich King into full health, the Vampire surges the Wraiths and the Catapult misses again. I take a chance to charge with my Lancers when it is presented to me, so I do, the rest of my line backs-up as I dont want to engage just yet. His Vampire is menacing my Skyriders but I want them there to annoy him so they move into the back of the Ghekkotah Warriors where he can't fit and the realise he made a terrible mistake with the Wraiths when he surged them 1 inch, I can turn my Battle-Captain and due to his rectangular base he is now into range! So I jump him there to keep those pesky things from flying, that is one more turn he is buying me. I move my Mage-priest into the right a lot as I've been a stupid and deployed him far away from the only Shambling unit I have..... yeah I'm not bright sometimes. 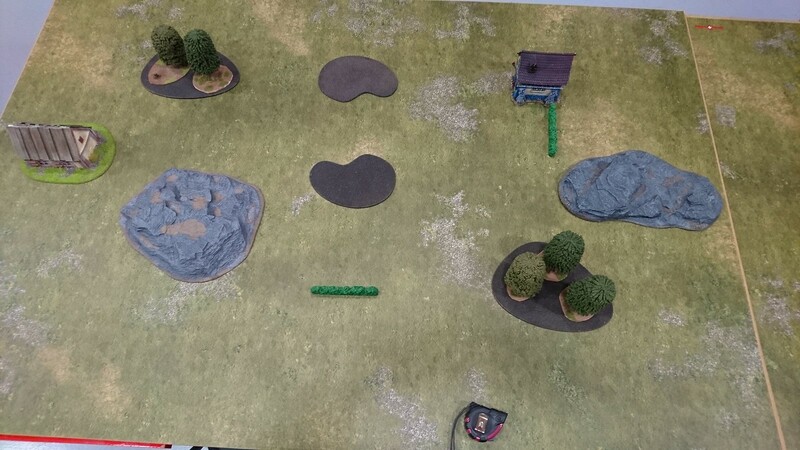 Shooting goes the same way, with the Werewolves getting again 4 wounds, and both Zombie based units getting a bit more damage. Then I roll for Nerve on the Werewolves and I roll 11! They are Wavered! Kaisenor Lancers do great putting 9 wounds to the Revenants but failing to rout them, the Battle-Captain does THREE wounds to the Wraiths and calls it a day. Bye my sweet friend. Not a very exciting turn yet again, he moves the centre up again, he knows I will be charging him so he is now provoking that actively, he intentionally keeps my Tyrants out of charge range but the rest is well withing range. His Revenants on the hill countercharge my Lancers and both the Vampire and the Wraiths charge the Battle-Captain. He heals the damn werewolves again and the Catapult misses.... My Skylord is rejoiced. Combats go as expected, my poor Battle-Captain dead as predicted and the Revenants chipping some wounds off the Lancers but not much. The Lancers decide to finish the Revenant Cavalry once and for all, and the Ghekkotah warriors turn to present the front to the Wraiths and Vampire. My Skylord finally reaches that catapult. Shooting phase comes and I'm not nearly as lucky as I was previously and the werewolves are free to move next turn. 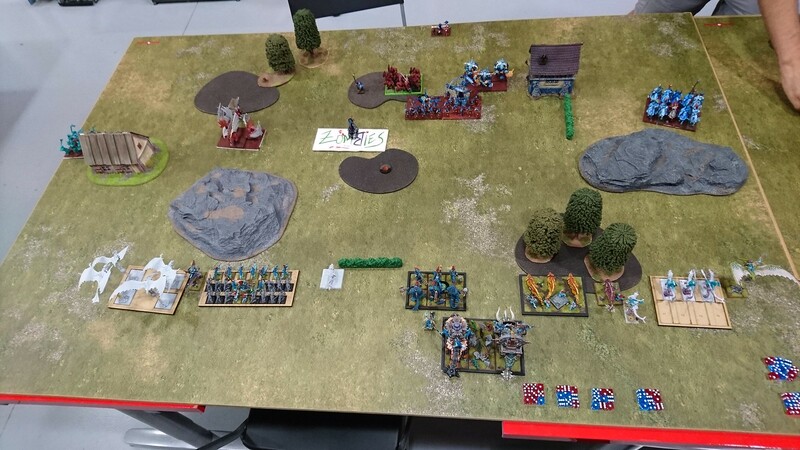 Combats are bloody indeed, the Lancers absolutely destroy the Revenants and turn to face the middle. The combined charge of the Ancients and the FE put and astonishing 19 wounds into the Revenants, with the Ancients doing most of the job there, I think they did 14 or so wounds, then I roll for Nerve and I get a 4, with Brutal that makes 24, that is one short, they will hold for one more turn. 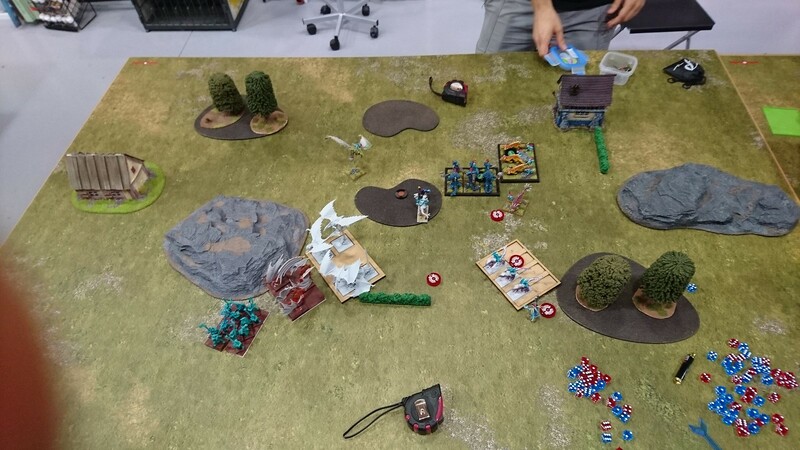 The Skylord obliterates the Catapult and reforms to face the back of the Undead forces, sooooo many juicy targets! I will start by apologising because I forgot to take a picture of this turn, I will do my best to give you a mental image, prepare your brains! 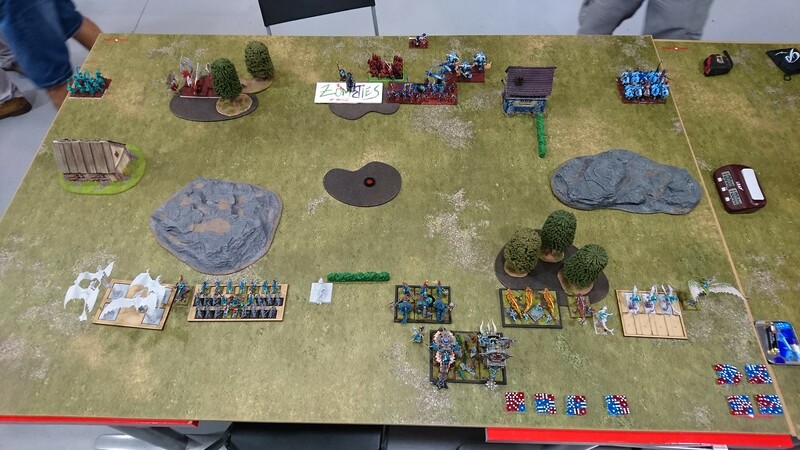 The Wraiths charge into the Ghekkotah Warriors, the Werewolves and the Vampire position themselves to have any targets next turn, behind the hill they couldn't see much. The Vampire jumps completely over it while the Werevolves move to be on top of it. Zombies charge the Lekelidon in front of them. The centre gets more complicated and much more interesting, he is determined to get the Soul revers into action, the only way he can do that is by backing the Zombie trolls, that leaves space for the Revenants to slide to the right in the charge against the Ancients and then the Soul Reaver Infantry has just enough space to contact the Ancients too. Very clever move. The Wraiths do plenty of damage (9 points if I recall correctly), way above average but not enough to waver a Horde of Infantry and they back up. Zombies waver the Lekelidon but he is still alive and being annoying. 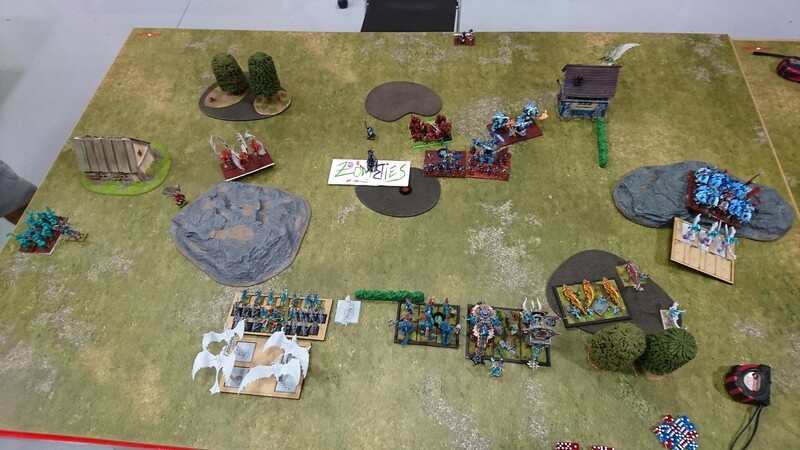 The Combined charge of the Revenants and the Hindered Soul Reavers put 10 wounds into my Ancients and then he rolls for Nerve and gets a 10, I ask him to roll again and then he says the worst thing a KoW player wants to hear: "Are you sure they are in Inspiring range?" I was a stupid fool and forgot to check my Inspiring ranges after the charge... The Ancients are dead. I was an idiot and paid for it, I was sure the Ancients will hold that charge and know I have to use my back up plan. I move my Lancers on top of the hill and turn them to face the centre, they will be able to clean up any remaining units in the late game. I nimble move my FE into the flank of the Revenant Horde while the Lekelidon advances again to chaff up the Zombie Trolls again, I counter charge the Ghekkotah Warriors and move the Skyriders into the flank of the Wraiths and deliberately into range of his Vampire, If can bait him into charging them that will deal with him for the rest of the game. I move my Herald at the Double to block the Tyrants into getting Hindered and charge them into the Soul Reavers. I then Surge the FE into the flank of the Revenants. 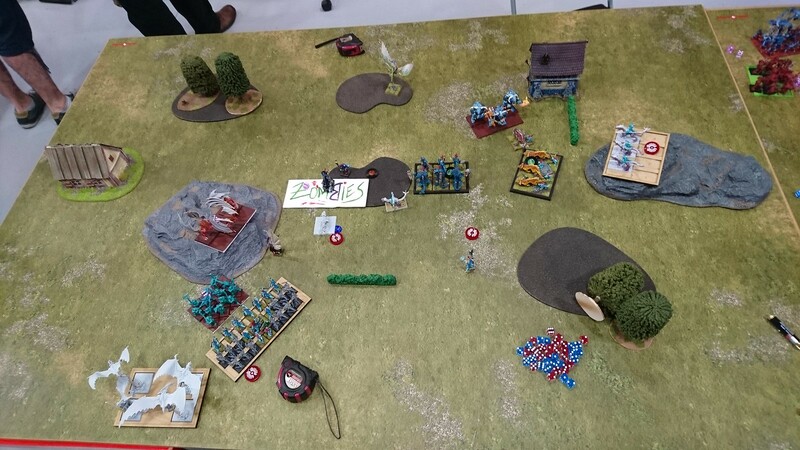 The FE destroy the Revenants with ease, although I did roll a three on the nerve test! That was scary. The Tyrants perform great against the Soul Reavers, doing 8 wounds and needing an 8 twice on the nerve to kill them, I get an 8 the first time and then i roll a TEN!!! oh yeah!!! Those Soul Reavers are GONE! Thanks Brutal! That leaves the field looking pretty well for me. My opponent is not stupid, I have two of the tokens in his half and all his units are blocked from getting near them this turn. He goes at it anyways, both Werewolves and Wraiths charge the Ghekkotah, zombies go into the Lekelidon again, the Vampire doesn't fall for the trap and charges my Mage-priest instead, and the Zombie Trolls charge the Tyrants to try and take that token. My poor Ghekkotah and Lekelidon die horribly but they did their part, they will be remembered. Both my Tyrants and Mage-Priest survive. 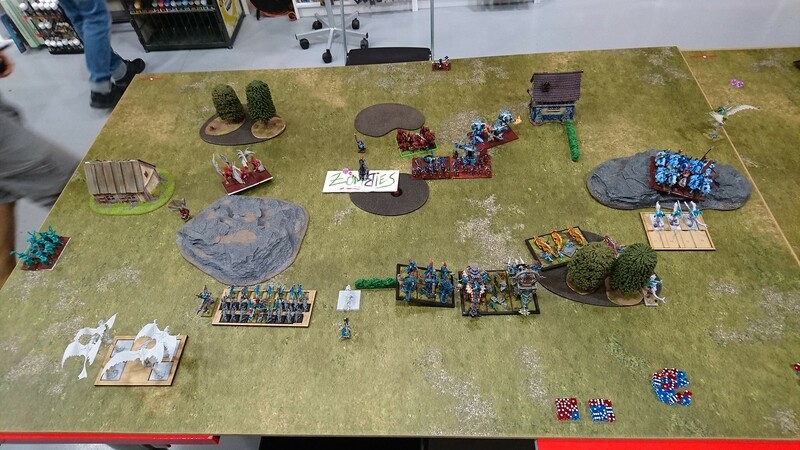 In my turn I charge his Zombie Trolls in the front with my Tyrants and on the flank with my FE, my Skyriders and Skylord charge both flanks of the Zombies and my Mage-Priest backs up leaving room for my Lancers to hit his Vampire Lord. Both units of Zombie based nastiness explode in a million pieces and my Lancers, the heroes of the day Waver the Vampire! With my Skyriders, Skylord and herald to block his units and two of my units with tokens on his side he concedes and the game ends.